"Garden Birdhouses Address Labels by Lorrie Weber" product is already in your cart. 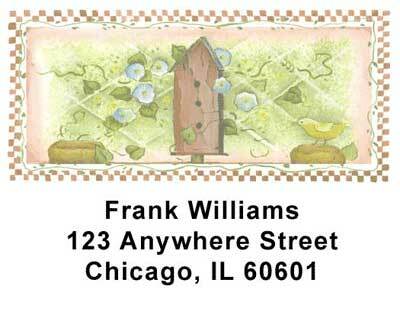 If you like your country garden, you will love these Garden Birdhouse Address Labels by artist Lorrie Weber. Outlined by a red and white checker pattern, each painting shows a rendering of different birdhouses in a garden setting. Show your country spirit with these Garden Birdhouses Address labels by Lorrie Weber. Matching checks are also available.